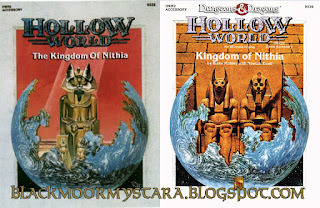 TSR often made alternate covers for their game supplements as part of pre production. Many times, these were also used in early advertising. 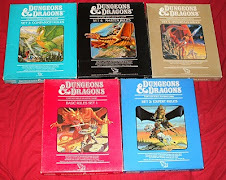 Orcs of Thar and the D&D Rules Cyclopedia are a couple of known examples. DA5 City of Blackmoor had a cover produced for it as well, but if the module had ever been releaset it is pretty certain that it would have gotten a different cover illustration than the one they used in marketing which was borrowed from a Dragonlance product. 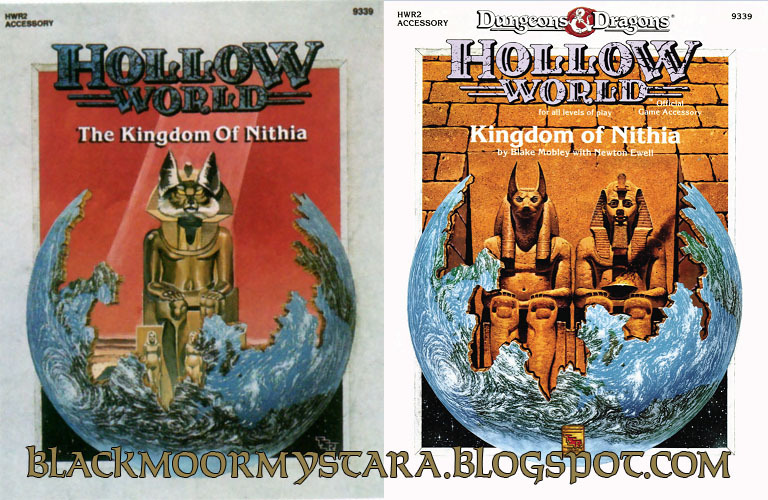 Here's another example, the Kingdom of Nithia which was part of the Hollow World series for Mystara. The cover to the right was the one they ended up using, but it is interesting to see the cover on the right having a different color hue and only a single statue. I almost like the idea of using this one for a fan created HW sourcebook for Hutaaka. What do you guys think of the alternate cover? Is that a werefox? Frankly its what you want when That lycanthrope in posession of nithian secrets annexes the emirates of ylaruam. It has a cool vibe; perhaps a bit less blatantly Egyptian than the one they ended up using. The preliminary design cover is fun, but the real cover has Pflarr and Rathanos, which is perfect. Love it!